If you have recently been to the Portsmouth SOMC LIFE Center on a Saturday morning, you might have seen Terry Dever on the pickleball court. Looking at Terry now as he runs around the court, you might not realize what he went through just a few short months ago: a double lung transplant. Nearing those few weeks before his surgery, Terry said he didn’t think he would have lived much longer. Then a miracle happened. Just three days after being placed on the organ donation waiting list, Terry received the call that changed everything: he had been matched with a donor! On Dec. 14, 2018, Terry’s life was changed forever as he underwent surgery to receive the gift of two new lungs. Terry went through surgery like a champion. Just a few days after surgery, he was sitting up in a chair and taking laps around the floor in the hospital. After originally being told he would be at the hospital and have to stay near the hospital upon release for 12 weeks, Terry was determined to get home sooner. His ambition led him to being in the hospital for just two weeks, and he only had to stay in Columbus for an additional two weeks after his hospital stay. Today, Terry said he truly feels like a new man. His family can attest to him living a new life, as well. His daughter, Megan Mckenzie, recalled the moment it truly dawned on her that her dad was now able to live the life he had dreamed of living. Before his surgery, he had to park at the top of Megan’s hill to be closer to the door, because walking up the hill was a difficult task for him. That first day he came over to her house after he returned home, he parked at the bottom of the hill. She asked him if he was able to walk up the hill. “That was the moment it hit me. He parked and I just remember him sprinting up the hill, it was such a surreal and amazing experience that I will never forget,” Megan said. Along with leading the life he wanted to live with his family, he remained diligent to gaining strength in rehab at SOMC, which he has already completed. He praises the team for helping him gain strength, strength he hasn’t felt for so long. “I feel better than normal,” he said. 2019 has been a transformative year for Terry all because someone gave him the gift of life through organ donation. We celebrate him and all the other patients who have received these precious gifts during Donate Life Month. We also honor and cherish those who have given the gift of life. Southern Ohio Medical Center will host the 33rd annual Hike for Hospice on Saturday, May 11. The event, which raises funds for the SOMC Hospice Caritas Fund, will begin at 9:00 am outside of the SOMC Hospice Center. Registration will begin at 8:00 am. Hike for Hospice is the program’s largest fundraiser and supports end-of-life care for patients faced with a terminal illness. Hike for Hospice t-shirts go on sale Monday, April 22 and can be purchased from the SOMC Main Campus. Shirts are $15 each. For additional information, contact Ann Luther at 740-356-2653. Recently, the SOMC Kardia Guild presented a donation of $5,000 to the SOMC Maternity Department to go towards the Maternity Bereavement Project. The project will assist families the maternity staff serve who are experiencing a loss. With the assistance of the guild donation, they have purchased more resources for the families through an organization, Resolve Through Sharing, which specializes in perinatal loss and bereavement. The guild members recently visited the department to speak with maternity staff and were able to see much of the project materials they assisted in purchasing. We thank the maternity staff for their dedication to serving families with the highest quality of care and striving to make a difference. A special thank you to the Kardia Guild for their immense support towards this worthwhile project! Southern Ohio Medical Center is presenting a day of fun, sun and kites at Dr. Singleton Park in West Portsmouth, Ohio. “Air It Up” is a free kite festival sponsored by the SOMC Community Health and Wellness Fund and thoracic surgeon Dr. Jeremiah Martin. It will take place on Saturday, April 6 from 1 to 4pm. The first 200 children will receive a free kite. The event will feature a large kite display from PIGS Aloft Cincinnati, inflatables and food trucks. There will also be lung health information and live entertainment by Shane Runion. Dr. Singleton Park is located at 22327 State Route 73, West Portsmouth OH 45663. For more information, visit www.somc.org. The SOMC Breast Center is now able to provide their patients state-of-the-art technology with their new Brevera breast biopsy machine. This purchase was made possible in-part through a $50,000 Appalachian Regional Commission (ACR) Grant earned by Cathy Mullins, Grant Writer for the SOMC Development Foundation. With the machine costing approximately $76,000, funds werestill needed to help purchase the machine. From there, the wonderful guildmembers of the SOMC Hope and Kardia Guilds graciously stepped in and donated the rest of the funds needed to purchase the advanced machine. The machine can be described as a camera that takes more in-depth and sharper images of the area being biopsied. This equipment also results in a quicker scan time for the patient. “[The Brevera] will reduce the number of samples taken (reduce the amount of tissue removed) and provides a good sample for the pathologist, reduce the amount of time the patient has to lay on the table in compression, reduce the amount of time it takes to perform a biopsy and allow us to perform more biopsies,” said Donna Corcoran, Manager of Mammography. 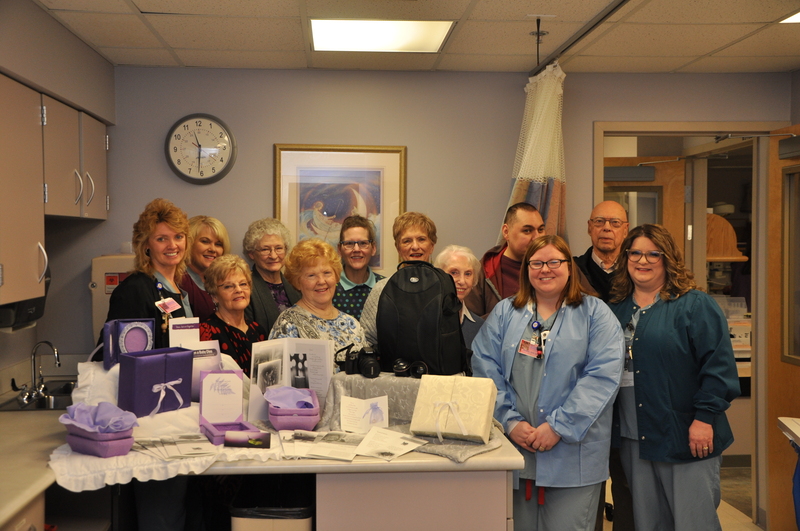 Recently, Donna was able to show the Hope and Kardia guild members the new machine in-person and speak with them about the benefits for the patients and staff. Many expect to come to work and have a normal day at the office, but sometimes fate has other plans. Kayla Tuel and her husband, Aaron, were awaiting the arrival of their baby boy. They went into the hospital at 3 a.m. on Wednesday, but the baby decided he wasn’t ready to meet the world, so they were sent home. A short six hours later, her and her husband raced to the hospital knowing their baby boy was coming soon. 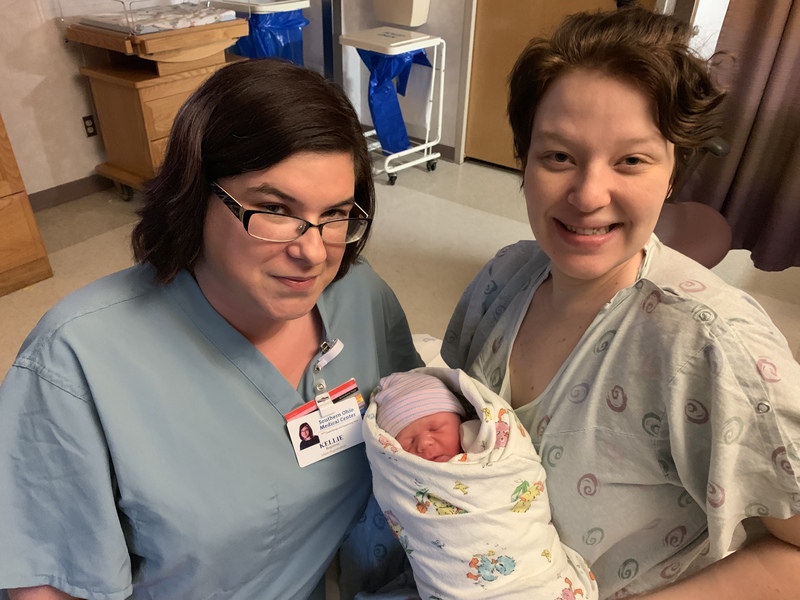 They were greeted by registration staff and Kellie Zoellner and JoJo Cooper volunteered to take her to the Maternity Department, not knowing what was ahead. By the time they got down the hall to the elevator, Kayla’s baby boy was ready to make his appearance! Kellie knew she had to jump into action quick and immediately called for a nurse. Kellie’s nerves didn’t hold her back. She was determined to take care of the expectant mother and her baby. “I need a nurse, and I need a nurse now!” she shouted out of the elevator. Karen Walburn of Employee Health and Wellness happened to be in the area at the time and jumped on the elevator to comfort Kayla. While Karen comforted Kayla, Kellie was able to welcome her baby, Daniel, into the world, an opportunity she never expected at work! After the excitement on the elevator, they finally reached the Maternity Department in a different fashion than most expectant mothers, with her baby in her arms. JoJo ran and got the maternity nurses and they quickly sprang into action. Definitely a birth story to remember! We appreciate Kellie, Karen and JoJo for jumping in and going above and beyond. We also wish congratulations to the family! Hoxworth Blood Center has announced that the Storm Bratchett Memorial Blood Drive will take place from 11am to 7pm, Mar. 7 and 8 at Christ’s Community Church (2433 25th St., Portsmouth). This is the 10th memorial drive for Storm Bratchett, who was only 17 years old when he was accidentally shot in the chest with an arrow in 2008. He was rushed to Southern Ohio Medical Center where doctors worked for hours trying to save his life, using more than 40 pints of blood. He did not survive. Appointments for the drive are strongly encouraged, but walk-ins are welcome. To schedule an appointment, please call 740-353-1633 or visit www.hoxworth.org/groups/storm. You can aslo schedule an appointment by calling Beverley Meadows at ext. 8670 or Kayla Groh at ext. 8223. Get into the spirit of Heart Month by stepping into your red attire for a ladies night out. We encourage you to join our Pamper Your Heart event from 5:30 p.m. to 8 p.m. on Saturday, Feb. 23 at the Friends Community Center. Gather your friends and enjoy the night out filled with shopping with local vendors, creating beautiful flower arrangements, heavy hor d’oeureves, wine and heart healthy education with Dr. Amy L. Heim D.D.S. !